Hello guys, currently I've got gadget in my ipad, been using it a lot since I make videogame music and found the chiptunes sounds convenient. Lately I've been getting more into trap / lo-fi beat making with my pc using fl studio, but I'm mostly working with my iPad. Since I haven't found many tutorials or links, would it be possible/recommended to get nanostudio2 for this purpose? Or it's better for other type of music? Thanks in advance, the software from what I've seen looks great and very professional! Thanks man! That would be great! When you make that youtube series please tell me, would appreciate it a lot! One glaring omission of Nanostudio 2 is it's lack of true 'note repeat' while you play live. You have to 'draw in' you're notes in the piano roll editor. This isn't a showstopper for a lot of trap producers that come from FL on PC but for physical equipment people such as myself its annoying. Yep. This is a real thing with regard to recording trap hi-hats. It's not a showstopper because you can absolutely get around it via the piano roll but, yeah, it's a missing bit for banging out quick trap beats if you're used to an MPC style note-repeat style workflow. On the flip side of that, with a single instance of Obsidian (and either an 808 kick sample or using built in analog-style synthesis) you can live out all of your trap bass dreams. And then some. You can do the 'normal' stuff you might need to do (play chromatic bass lines, add filters, etc) but you can go way way beyond that with the rest of the synth before you even get to adding effects in the mixer (bit reduction, decay modulation, variable 'punch', overdrive... all in Obsidian). I have a few trap-in-progress projects banging around. If I ever actually finish one, I'll post it here. I fear I'm too old though — they never bang the way the Trap I like to listen to does. That's not NanoStudio's fault though—it's me and my gray beard and my fatherhood and my mortgage payments, etc. So if you want trap hats, you just make a couple different pads in different retrigger lengths and you're set! It's probably easier to use live than using three fingers to hold down note repeat, a pad and select different speeds. I've seen finger drummers use this on the Push, which actually supports live note repeat. Very Interesting! I’ll try that out! So if you want trap hats, you just make a couple different pads in different retrigger lengths and you're set! My method is similar but I don't use the workaround. I record the single hi-hat pad and when I would normally trigger some variation (32nds or triplets or...) I press and hold a different pad. Then, I go into the edit screen and use those extra notes as a guide for where to insert the variations with the note-repeat edit tools. Gives you the feel of doing it live and the precision of editing tools. It's probably easier to use live than using three fingers to hold down note repeat, a pad and select different speeds. I've seen finger drummers use this on the Push, which actually supports live note repeat. Hmm. 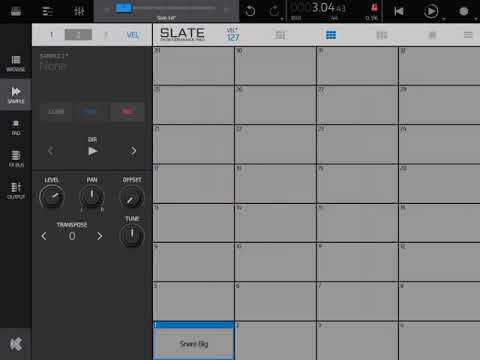 Not that I wanna add to Matt's list but this has me wondering about the ability to set note-repeat per slate pad instead of only per kit (like MPCs or the TRG). That way, you could set certain pads to 8ths or 32nds or whatever and any time you held that pad, those trigger values would follow along with you, much like Dendy's trick but as MIDI information. That would also, presumably, allow you to set a pad to 1bar or 4bars and produce the oft requested 'latched loops'. That would be crazy! Excellent idea. Not that I wish to also add to Matt's insanely large update list too, but this morning it occurred to me that what would be really nice on repeat triggers would to be have an ability (with options) to transform velocities when pressing one of Slate's pads down, so that the velocity would be drawn with a 'fade in', to simulate a more natural drum roll. The opposite could also be done too, as well as both together, and hold included of course, and also without. If that all makes much sense? Worth noting, if you use Obsidian as a sampler it gives you another option for playing trap hats live. You can put the same hat on 3 neighboring keys and swipe between them with one finger to get that machine gun gate. If you let 2 fingers "walk" perpendicularly over those keys it's not too dissimilar to playing a roll using sticks (if iOS allowed for 2 pencils to work simultaneously on the same device that would be an even better way to capture natural playing). For pitch variation just put a higher or lower pitched hat on the next 3 keys, and so on as needed. If you record with quantize on then the notes will land precisely/evenly distributed in the sequencer even if they don't sound perfect while performing/recording. You should be able to automate volume and velocity across the sequence for more dynamic variation. Since hats are basically treated like a separate instrument in trap music anyway, this makes mixing the hat (Obsidian track) intuitive and allows for easy volume automation recording using the mixer. Just thought this method was worth noting, even though it's not a perfect solution it does work quickly and relatively easily. A quantized note repeat per Slate pad would be ideal for this though. That’s actually a genius idea! Thanks! @3sleeves what a idea !!! Seems like it should also be possible to get LFO->ENV retriggering to do 8th, 16th and 32nds (or whatever) via key splits. Or maybe use the XY pad to adjust it freely? Dendy, can you hear me? Is it time for an "Obsidian for Drums" patch of the month club? February? I just knocked up this patch as an example. I couldn’t get the envelopes to retrigger a closed hat sample, probably beacause it’s too short, so I put the spectral sampler on to give it some sustain and set snappy envelopes for each of the 3 sample Oscillators, all playing the same sample. On C3 is an 8th note, D3 16th and E3 32nd note repeat. Here’s another example patch using noise as the source for the closed hi hat. Performance Knob 3 sets the repeat rate. Knob base value 0 is 8th note, 50 is 16th note, 80 32nd note. The 12th, 24th and 64th values are obviously there too. Nothing special, but it might suit some. @LeeB Excellent patches, this makes it easier to play! I’m experimenting with my own hat samples in this patch, also setting voice to glide and messing with pitch bending...interesting so far. I forgot to mention that swapping the samples about might yield some better results. I only tried with one closed hat. It’s a shame though that it has to go through the spectral sampler to work as you lose the original sound. Hopefully Matt may be able to address that when he gets the other more important things out of the way. Ok.. WHAT a superawesome ida with that synced LFO retrigerring controlled by XY pad !!! I'm just really pissed on myself that i didn't got this idea first This is it !!! Instant autobeat !